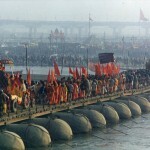 Spirit of Moksha is a self explanatory journey to explore various aspects of largest human gathering on earth i.e Kumbh Mela, 2010, Haridwar. What is this sacred belief and what drives millions of people across the world believe in such a time immemorial event? The relevance of this largest religious festival on earth has stood the test of time and has always remained contemporary. It has evolved out of the need for mankind and still continues to do so by encompassing the humane aspects of purity, truth, unity, gratitude, happiness etc. this finally leads to the divine path developing the spirit of Moksha.